December 10th through the 22nd, What...Us Slow Down? I'm not quite sure what I was thinking, but I was certainly wrong about it! I had the assumption that after the SJMMW that things would slow down at the Dismuke house; but I was wrong...very wrong!! Granted that even though we didn't have seven soccer practices during the week for the girls or any regular appointments at SJ for Ingram, we still haven't had any free time. And the sad thing is that we have no idea where all of our time is going?? It's totally crazy and the only proof we have is how tired we all are at the end of every day. We have made a few trips to St. Jude for special events with our ALSAC peoples and always have a fun time seeing them. We were able to get on phone calls with Mr. Shadyac and personally thank donors and wish them a Merry Christmas too. Ingram thought it was really fun because he got to walk around in Mr. Shadyacs office and he got cookies!! Madison also had her very own meeting with Mrs. Emily Greer (ALSAC Chief of Staff) to do some research for a school project; one of her questions on her list was "If I were to take Mr. Shadyac's job when I'm out of college, what degree should I have?" Yep, Madison is just that ambitious and we love it!! 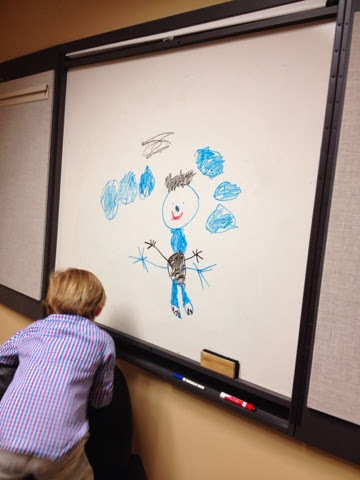 Ingram found a dry erase board in an empty conference room and practiced writing and drawing while Madison was on her meeting. Thankfully no one caught him spinning in the chair or standing up in it to draw!! 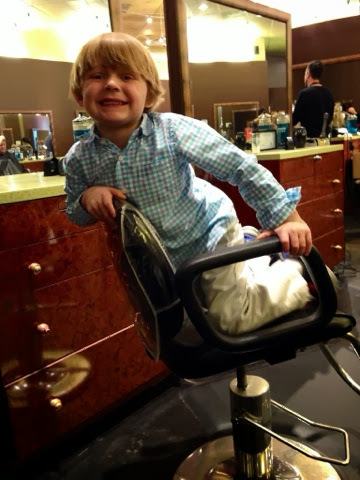 Ingram also had his first real haircut since completing treatment back in October of 2012. Actually, Craig has been trimming his hair for as long as I can remember so letting someone else touch his hair was a big deal!! Daddy and Madison took Ingram for his haircut while I went on a lunch date with Lindsey; personally I think Craig wanted to be able to "advise" Natalie on how to cut Ingram's hair just right. As you can see from the pictures, Ingram had fun and his just looks great! Ingram even said that he wanted to have his "bright red shaggy hair back" and well you can see it's slowing getting back there. Our friends Marvin and Grey Smith headed off to New York City to a special event with New York Yankees Mario Riveria over the Thanksgiving break. 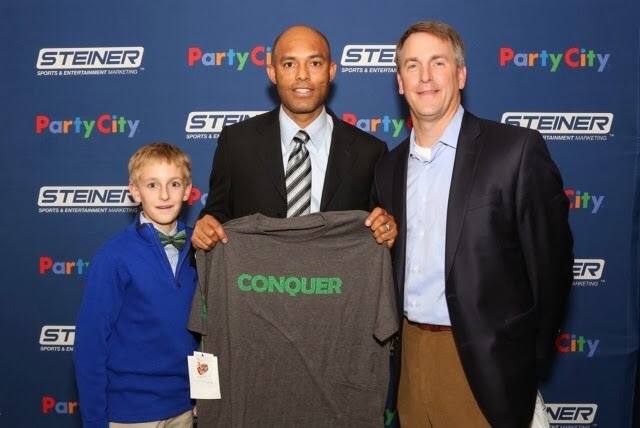 When we found out they were going, we decided it'd be great to pass along a CONQUER shirt to him and spread a little Team Ingram/St. Jude/Childhood Cancer awareness all at the same time. They had a great time in NYC and just got the official picture back from the Yankees. So here it is...Can you tell how excited Grey is?! I guess another reason were staying busy is we can't stay out of the Doctor's office!! Each of the kids and myself have been in for visits and hopefully our house is on the way to recovering. Ingram was diagnosed with Bronchitis, Madison was diagnosed with Sinusitis, and I ended up with a sinus infection and an ear infection. Lindsey and Daddy were the only ones that have been on the healthy side of things and hopefully all of our crazy weather changes won't get them on the sick side too. The down side of Ingram's bronchitis was that he missed the last few days of Preschool that included his Christmas party. But we managed to enjoy ourselves in our pajamas at home and squeezed in about 6 hours worth of naps during those same days. That much napping is a definite sign Ingram wasn't feeling good!! 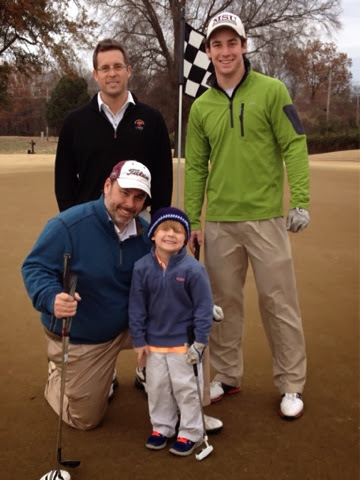 Ingram also got a very special invitation to go golfing with his favorite Mississippi State Bulldog Mr. Brent and his Dad, Mr. Rooker. 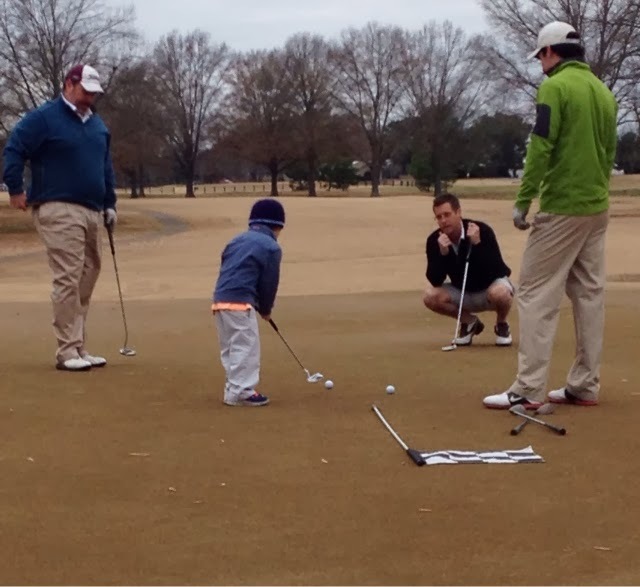 Daddy was excited about playing a few holes too and all four of them tons of fun together. 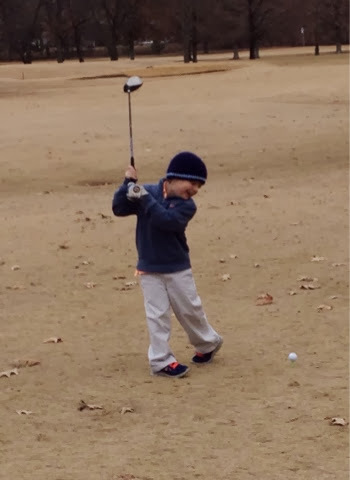 It was a chilly and cloudy day, but Ingram was more than happy to spend an hour or two on the golf course before I made him take yet another nap. Ingram ran all around the fairways and the greens but loved riding around in the golf cart with Mr. Rooker even more. He even picked riding with Mr. Rooker over his own Mommy! When it came time to actually play, the guys would hit their balls and then Ingram would tee his off with about 100 yards left to the hole. Ingram nailed a few fabulous hits with his driver down the middle and sides of the Fairway and had lots of fun putting on the Green. Those golf clubs G-Daddy gave Ingram for his birthday are definitely coming in handy now! Since it is Christmas break after all, we decided to make a special trip to see Santa Claus! We of course went while Santa was on his lunch break (and on a Saturday) and ended up waiting for quite a while to talk about the "Naughty and Nice" list with the big man in red. After watching people try for that perfect picture with Santa, we decided to do the perfect Dismuke picture and show each of the kids playfulness! 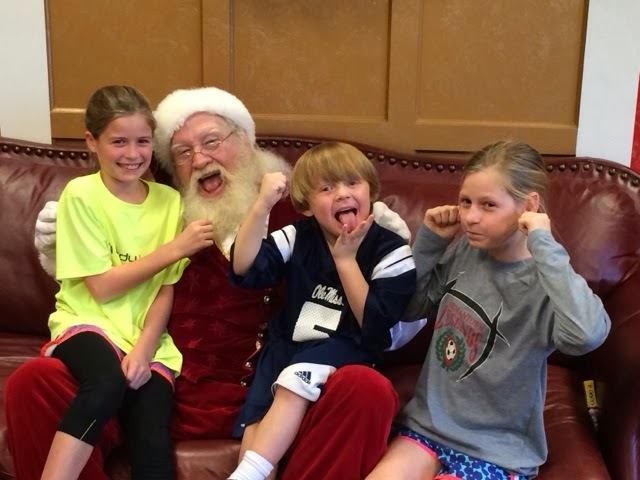 With Santa's permission, the kids had a fun time taking pictures with him that were Dismuke style! And even after pulling his beard, making faces, and making monkey faces, Santa said that he would leave all three of the kids on the Nice list so they were pretty pumped. 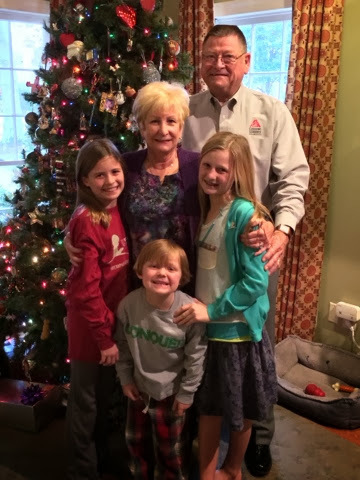 We also celebrated Christmas a little early with Mimi and Pops when they came in town for our Christmas service at church. What they didn't know was that Madison was going to be a part of the program and read some scripture passages in front of the church. I guess it was like an early Christmas gift seeing her so very excited about reading and doing a great job of it. Afterwards, we headed out to lunch with Mimi and Pops before we opened presents with them. Now maybe with all of our Christmas shopping completed and everything wrapped, we might actually get to slow down a bit and focus on Christmas itself. Friday to Monday December 6th to 9th, A Long And Special Weekend! Friday started out pretty crazy with the kids being out of school due to the weather; anytime there's a chance of anything other than rain, it's utter chaos in Memphis! G-Mommy and G-Daddy even made it in from Texas early because of the weather and brought friends with them for race weekend and we got to spend a lot of time with them over the weekend as well. With a snow day and a full house, you can imagine how loud our house got!! We also were delivered a copy of the Memphis Parent Magazine that had our family's story in it from our October interviews. It's always so fun to see how our story is written and we love the opportunity to share with so many others the good and the bad of Cancer. Despite the crazy rain and ice combo, we managed to have a pretty fun day at the house getting ready for the race. By the time we made it downtown for the SJMMW Hero's Pasta Dinner, we had already passed several wrecks on the interstate and slid a few times on the overpasses ourselves. We were so sad to hear that the race was cancelled because of the weather, but we tried to make the best of the night anyway. The fact that the race was cancelled didn't change how much money everyone raised for the kids of St. Jude and it was even the biggest total yet...at $8.2 million dollars!!! Madison and Lindsey both ended up at the top of the Individual Fundraiser List with Madison coming in First Place with $41,495 and Lindsey coming in Third Place with $29,400. We also were so excited to hear that Team Ingram was the First Place Fundraising Team this year with $115,000 thanks to the help of tons of donors. The girls and Ingram went up on the stage with Mr. Shadyac to say a few words and of course Ingram ran around like a crazy boy...again! I'm not sure he will ever be in slow motion, but at least he's happy and healthy so I'm not going to try to worry too much with his Energizer Bunny attitude! We saw several of our SJ friends and of course all of our ALSAC folks! One of our friends with her own amazing cancer story was the Patient speaker at the Pasta Dinner. We met Hillary while we were in treatment while she was battling her second cancer. She and Ingram were fast friends and Madison and Lindsey were very impressed that she did her own marathon while she was inpatient during a transplant. The kids also had fun chatting with Mr. Joe Birch from Action News 5 and with Mr. Shadyac; for some reason they aren't shy at all and don't seem to meet any strangers anymore! We met tons of new friends that were raising money for St. Jude and saw some familiar faces from the year before. Make sure you check out the "Team O" pictures below that show last year's group and this year's group; these are some pretty amazing kids and they work hard to raise money for St. Jude! The Pictures Along Bring Up Lots Of Memories! The Top Family Picture Was Taken The Day Before Ingram Started Radiation. The Bottom "Bald" Picture Was Taken During Ingram's Second Inpatient Stay For Round Two Of Chemo AND Right After He Lost All His Hair. "Team O" At The 2013 SJMMW Hero Pasta Dinner! And Yes, Ingram Is Wearing The Same Green Shirt And The Same Boots! 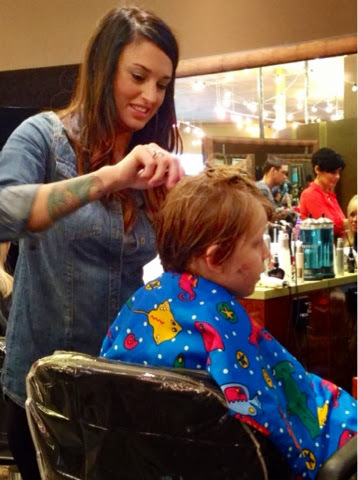 Two Girls On A Mission For St. Jude Children's Research Hospital! Nothing Is Going To Stop Them!! The Kids Just Found All Of The Dismuke Family Names Registered For The Race!! I'm Not So Sure She Won't Try To Take His Job In About 20 Years And Run ALSAC! She's Always Trying To Learn More About Fundraising For SJ!! Has Definitely Entered The Building! They Came Up From Texas To Do The 5K In Honor Of Ingram! Saturday morning (very early I must add), Fox and Friends aired the segment that they filmed with us in early November. We were actually still asleep, but had set the DVR to record it since we stayed up so late the night before. The kids got so excited when the segment and even Lindsey was in it; granted it was on in the form of pictures since she had the stomach bug while we were filming. The link is below!! Saturday started out great with the Fox and Friends segment and continued to get better even though the official SJ race was cancelled. One of Lindsey's teammates decided that she was going to run anyway and it sort of snowballed into our own Lady Lobos SJ 5K! Olivia may have started the idea of the running even though the race was called off, but we ended up having about 40 folks out in the 25 degree weather to show their support for St. Jude and the Dismuke crew. It was a pretty special day and we couldn't be more proud to call all of these girls and their families our friends! To celebrate, we surprised Lindsey with a trip to see Frozen at the movie theater with all her teammates as an early birthday present and she loved it! I mean, we were already numb everywhere, why not include Frozen into the mix too! Trying To Stay Warm Before These Girls Run Their Own SJ 5K! Ingram Starting The Race With His Infamous Vuvuzela! Most Starters Don't Also Start, But Ingram Didn't Want To Miss The Action! 3.1 Miles Despite The 25 Degree Weather! Sunday was Lindsey's actual birthday and now she is 10 year old...Double Digits!! Since the race weekend was supposed to be happening and we had lots to do with Team Ingram, we didn't plan anything for her birthday. Once the race was cancelled, we (with the help of Madison and Ingram) started planning the craftiest party ever...literally! We had a bunch of different crafts set up and the girls spent hours making snowflakes, cookies, snowmen, reindeer and it was just perfect for Lindsey the Artisan. Even Ingram and Madison had a fun time with all the crafts and especially decorating and eating the sugar cookies! The First Of Many Indoor Snowball Fights At The Dismuke House! Final Creation About 45 Minutes Later...Giant Snowflakes Made Out Of 6 Pieces Of Paper! Thankfully, She Did Not Eat All Of Them! After the sugar high and the sugar crash, everyone headed off to bed and we didn't even have family birthday dinner for Lindsey! Not to worry though, we made up for it with special lunch at school and Monday night with Lindsey's special request of spaghetti and S'mores! Oh I hope that her list of favorites is always this simple when it comes to celebrations, especially S'mores made in the den because it's just wayyyyy to cold outside to mess with the fireplace. Happy 10th Birthday Peanut!! Most of you know by now that the St. Jude Memphis Marathon has been cancelled. While we are sad about it, we fully support the tough decision that Rick Shadyac and the ALSAC team had to make for the safety of everyone involved in the race from the runners to the volunteers to the spectators. We were able to go to the St. Jude Hero Pasta Dinner and met a ton of fabulous folks that were running as St. Jude Heroes (more to come about that later)! As a St. Jude family, we just want to say thank you to all of... you who prepared for, planned to run, and made the the 2013 St. Jude Marathon the biggest fundraising event in St. Jude history! It's hard to express how encouraging it is to see 20,000 people come together for something that means so much to you. Obviously, everyone is disappointed that the race couldn't go on, but we truly hope that everyone will be back in 2014. Your presence means the world to a whole lot of families. We love St. Jude and we especially love St. Jude Heroes! Monday to Thursday December 2nd to 5th, Getting Ready For The Cold, Rain, Ice, And Snow? We've had a very busy week getting things ready for the SJ Memphis Marathon Weekend and being busy has been another good distraction for all of us. We've been watching the weather and wondering just how cold it will be when we're running to figure out clothes, hats, gloves, hand warmers, etc. We have decided most likely to not have Ingram out on the course, but instead keep him inside Redbird Stadium where he can stay dry and warm. Although he's still saying he's going to run "the marathon" with us, I'm pretty sure he'll be happy when he see's some of his little buddies hanging indoors too. Since chemo and everything, he seems to get sicker quicker than he used to and it often turns into a more intense infection that takes longer to get rid of just like all his sinus infections. But, even with the crazy weather, Team Ingram is going to "Get Our Move On!" We also found out that the The Fox and Friend interview originally scheduled to air Friday morning has been rescheduled to Saturday morning. I'm guessing this huge Ice Storm 2013 might end up taking over all the air time if it really happens as the forecasters are predicting. The girls have heard all about the Ice Storm of 1994 and cannot believe all the things we've told them about it or the fact that we're soooo old! Whenever the segment is aired, we will have a link to it and pass it along; just remember Lindsey is still part of the family, she was just dealing with the stomach bug when we were being interview. More importantly, please keep our sweet friend Allie in your prayers. Ingram and Allie met at the Fed Ex St. Jude Classic and became quick friends despite their major age difference. Allie was diagnosed in February of 2013 with the same kind of cancer that Ingram is fighting. Ingram was also the first person Allie had met that had her same cancer type and we live only miles from each other and we go to the same schools. We met her family the year before at the same tournament while Ingram was participating in the Little Looper program for the first time; her dad and brother drove us around the course in the golf carts as fast as Ingram told them. They just found out hat it looks like the tumors have come back and they're doing more test this coming week to figure out an attack plan. Allie hasn't let Cancer get in her way and has continued to be an exceptional student and cheerleader while she was undergoing treatment. This totally breaks our hearts and has devastated the family. Please petition God to heal Allie's body and to give her and her family His peace. Monday to Sunday November 25th to December 1st, Texas Thanksgiving Traditions And More!! I'm not even sure where to start and I certainly didn't think this post would be so difficult! We had a great Thanksgiving holiday away in Texas with G-Mommy, G-Daddy, Grandmother, and Aunt Leigh. Beau even was able to make the 12 hour car ride (both ways) with us. We enjoyed seeing some of our Texas friends and carried on with our regular Texas Thanksgiving Traditions that we've been doing for the past 15 years; well minus one year for when Lindsey was about to be born and last year when we were in New York for the "Thanks and Giving" campaign. We had two hours of traffic delays (mostly stand-still traffic... thank you Arkansas Highway Department), lots of restroom breaks on the road, and even more gas and food stops along the way. The kids all slept in the same room and, of course, woke up early every day and were ready to do something all day long. We went ice skating at night in the 30 degree temperatures, made Gingerbread men and houses, helped make and eat a Thanksgiving feast with a house full of new and old friends and family, played golf a few times with the kids, went on a thousand walks with Beau and even tied the kids up in Christmas lights for an attempted Christmas card picture. We also had our traditional dinner at "Taste of Texas" which included a birthday celebration for Lindsey with a huge sparkler candle in a huge ice cream sundae. To our surprise, we saw ourselves on TV with the special "Thanks and Giving" kickoff interview between Mr. Shadyac and Anna Kooiman of Fox and Friends. Programming note... our full segment/interview promoting the SJ Memphis Marathon Weekend with Anna will be on Friday morning December 6th on Fox and Friends. We will also post it on the blob and on Ingram's Facebook page once it's out. We made it back to Tennessee in time for Madison to make it to her first real dance with her friends. It was a blast getting her ready and all, but I'm not quite sure we're ready for this new stage of growing up! Lindsey was at soccer practice, but Ingram went with us and had a blast at The Peabody and at The Gibson Guitar Factory playing with his friend Katie the whole time. Ingram Glued To The TV While Lindsey Is Glued To Beau! Madison's Already Giving Me The "Really Mommy" Look! The Two "KID's" Heading Off To Hit Golfballs! But Clearly Making Candy With G-Mommy Made It Better! Madison Rolling Up Chocolate, Coconut, And Marshmallows! It Was Definitely Back Breaking Work In The Beginning! These Two Were Trying To Break Our Backs By Skating Into Us! We All Fell At Least Once And We All Came Out In One Piece! Ashley, Craig, Madison, Lindsey, And Of Course Ingram! Apparently He's Sweaty And Hot From Skating In The 30 Degree Weather! Someone's Not Digging The Smell Of The Mushroom Soup! The Thanksgiving Dinner Crew Minus Daddy Who's Taking The Picture! Part Of The Finished Product Before They Were Eaten! Sneak Preview Of Our Christmas Card Picture! "Madison I'm Mad At You So I Put On Your Clothes. Ha!" Said Ingram To Madison While We Were Busting Out In Laughter! Quite Possibly Lindsey's Favorite Part Of The Trip...Every Year! Taking A Million Pictures In The Sleigh Outside The Restaurant! Where Did Our Baby Go?? All Dressed Up And Ready For The Jingle Bell Ball! "No Madison Don't Kiss Me! 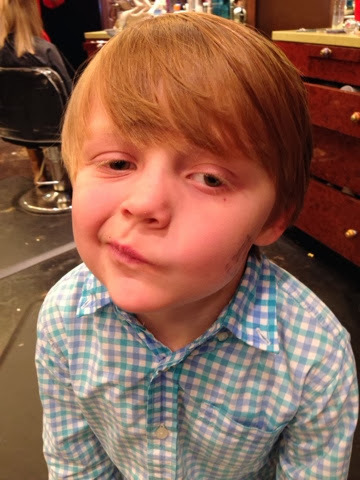 Your Lips Are Like Mommy's!" Part Of Our Jingle Bell Ball Crew From School. Photobomber Extrordianire Ingram With Malena, Madison, Gracie, Molly, And Suzanna! Ingram And Katie Waiting On The Peabody Ducks While We Wait On The Ball To End! I Hope Ingram Doesn't Touch Them! Who Needs To Worry About The Toy Soldier Guard? If Any Boys Mess With Madison, They'll Have To Answer To Ingram! Here's where the difficult part starts...With it being the Thanksgiving holidays, we just can't help think about being thankful. We are thankful beyond words to our wonderful doctors, nurses, child life specialists, therapists, and many others at LeBonheur and St. Jude Children's Hospitals, but most of all to our Heavenly Father for bringing our family to this point of our journey. It's absolutely amazing to think about where we are today compared to where we were just a year ago. 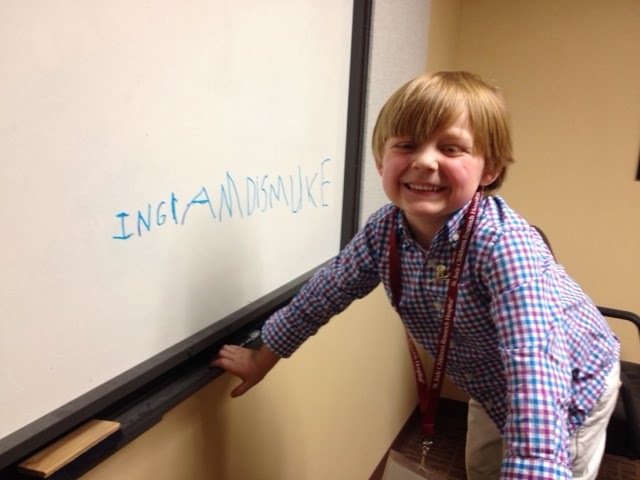 We thank God several times every day for taking away Ingram's tumor and healing his body, but for a holiday that started with being thankful for provisions way back with the "Pilgrims and Indians" as our kids say, it's turned into a whole lot more. With the overwhelming thanks we feel, there is also a very strange and struggling emotion of guilt that comes along with it... especially for me. Ingram "sailed" through treatment for the most part only have a handful of bad days compared with many of his friends. Being at St. Jude, we've met soooo many great friends that we now call family, but they're not celebrating Thanksgiving with their children at home. Some of Ingram's friends are having a true Thanksgiving in Heaven while their families are simply enduring the holiday as best they can. We have other friends that are too sick to gather with their families for fear of unknown germs/viruses being carried around because their counts are too low to risk it; and, there are other families spending Thanksgiving separated in the hospital. I have no idea what it would be like for us if we were in one of those situations, but I do know that our cancer diagnosis has changed our daily lives forever... holiday or any other day. Please remember everyone that has been touched with cancer in your prayers even if they look like they're doing just fine each day, because like I've said before... cancer changes everything.